Liz Coll is a consumer policy analyst and expert on consumer behaviour in the digital age, specialising in the impact of connected, digital technology on markets, consumers and regulation. She currently leads Consumers International’s digital advocacy strategy. She is a regular speaker, panelist and author on consumer data and digital issues in the UK and globally. Previously at Consumer Futures, the UK’s statutory consumer body, her work on consumer principles for online public services was taken up by the UK Government Digital Service; she also led work on collaborative peer to peer networks, privacy and the role of personal data in consumer empowerment. Before that she was a strategic advisor at global sustainability non-profit Forum for the Future, working with public and private sector clients' organisational change, and a researcher at London School of Economic’s (LSE) Centre for Risk and Regulation. She has a BA in Politics from the University of Sussex and an MSc in Political Sociology from the LSE. Liz sits on a number of groups representing consumer interests in digital matters, including UK domain name registry Nominet, and has worked with business groups and major digital companies to champion consumer-centered practice. Liz, tell us a bit more about your background and your projects so far. I have worked on consumer issues and tech for about 10 years now, my very first project was looking at digital public services worked (or didn’t work!) for people. I felt there was so much potential for digital delivery to make people’s lives easier, but things were still being built without people in mind, and without thinking about things like trust. There seemed to be a massive opportunity to make things easier and better for people. Working on consumer issues is fascinating as we are all consumers and at the moment, as the digital economy and society is transforming relationships between business, government and people, it feels like a great space to be able to make an impact. All of the projects and work I’ve done are about questioning ‘business as usual’ and making the case for doing things in a fairer, more human-centered way. I head up the digital programme at Consumers International. We’re a membership organisation of consumer groups from almost every country in the world. In the West we think of household names like Consumer Reports or Which?, but in every single country there are passionate, smart organisations fighting every day to get a good deal for consumers. In some places that means the basics like clean water or safe food. In others it might be about affordable access to energy or the internet, for others it could be class actions against unfair data use. As well as representing consumers’ interests in big international forums like OECD or G20, I also lead a team that runs projects on things like consumers’ experience of artificial intelligence, or developing guidelines for trusted consumer IoT. We hold a Summit every four years where all of members come together, this year is the first time we have opened it up to a much wider audience – we think that is really important if we want to make change happen fast. 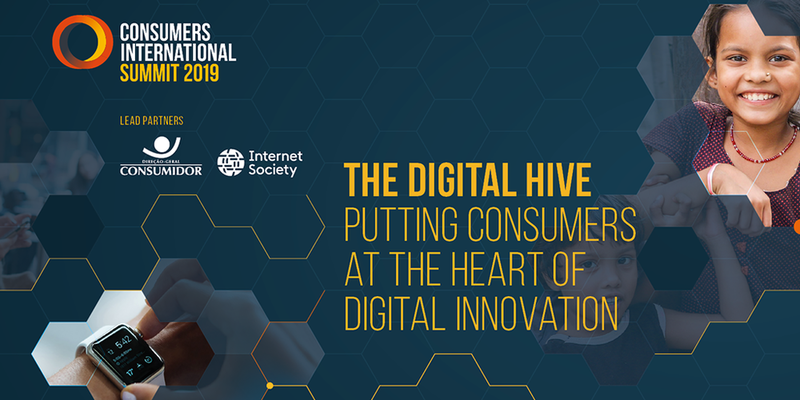 Its being held in Portugal this year, where we’ll bring together a uniquely broad group of contributors, with consumer organisations from around the globe working together with representatives from business, civil society and governments, providing a holistic view of the digital world, its possibilities and pitfalls. I’ve helped to shape the programme, bring in speakers and make sure we create an exciting, challenging but constructive space to have the sort of conversations between sectors that can make change happen. Focus of this year’s summit is 'Consumers at the Heart of Digital Innovation'. What does digital innovation represent to you? Do you think businesses and consumers today are aware of what it means to be digitally up to date with technology trends? You find the term ‘innovation’ used in opposition to things like ‘protection or regulation’. There’s this idea that it’s a trade off – you can only have innovation if you create a free for all that’s open for experimentation. But that’s just not true – people have created fantastic health innovations within quite strict frameworks, you can have both. We want to see innovation that delivers what people really need (and here’s a clue – that isn’t just personalised advertising!). We need to reclaim it - real innovation should be about making digital work really hard for people, not just for profit. Putting people at the heart – thinking about good consumer outcomes from their point of view would really help to unlock new services and products. That’s what we’re asking all of the participants at the Summit, from AI to mobile tech, to the sharing economy – what does it look like if your starting point is the consumer – you might see services and products and regulation delivered in a very different way. You would certainly be able to anticipate and see off some of the problems that arise with new services, before they happen. What do the #WomenInTech and #diversity movements mean to you? Do you get many female speakers at the summit? How about female participants and attendees? We are lucky in the consumer movement to have a good balance of men and women in leadership positions. The bigger challenge for us is to get the message across that they all have something important to contribute to digital debates – even if they are not from the tech sector. Our events and projects are usually pretty mixed, and we made sure we carried that through to the Summit. Just look at our speaker page and I think you’ll see it looks different to most tech conferences. And it was easy – these women are all out there! We wanted to show that it is not hard to get great female speakers on any topic, from any country, we have women from Uganda, India, Germany, Brazil and Israel talking about everything from mobile-only access to IoT to AI, sustainability and fintech. We have CEOs, academics, Government ministers and of course our members. Generally I think the problem is tech is seen as being closed off to all sorts of groups or sectors in society. But digital tech impacts everyone, it is too important to be left to lawyers and engineers. We all have a stake in our digital future – so we’re really proud to show how easy it is to bring in a wider range of voices. Who are your 3 inspirational companies / individuals in the world of technology? Academics like Julia Powles really inspire me for the way they can link together big ideas on things like competition and data and yet still make the link to the impact on people – it’s a hard thing to do! Lillian Nalwoga from CIPESA is someone I met through a project on digital and consumer rights. Her work on internet shutdowns was one of the first to broaden out the impact from freedom of expression to livelihoods, consumers and economies. And of course in the consumer movement, there are so many national organisations shaping digital law and taking class actions against some of the biggest companies in the world, with much bigger lobbying budgets. They are brave and not afraid to go against the tide and you have to be inspired by that!